Genetic alterations, including mutation of epidermal growth factor receptor or v-Ki-ras2 kirsten rat sarcoma viral oncogene homolog and fusion of anaplastic lymphoma kinase (ALK), RET proto-oncogene (RET), or v-ros UR2 sarcoma virus oncogene homolog 1 (ROS1), occur in non-small cell lung cancers, and these oncogenic drivers are important biomarkers for targeted therapies. A useful technique to screen for these fusions is the detection of native carboxy-terminal (C-terminal) protein by immunohistochemistry; however, the effects of other genetic alterations on C-terminal expression is not fully understood. In this study, we evaluated whether C-terminal expression is specifically elevated by fusion with or without typical genetic alterations of lung cancer. In 37 human lung cancer cell lines and four tissue specimens, protein and mRNA levels were measured by capillary western blotting and reverse transcription–PCR, respectively. Compared with the median of all 37 cell lines, mRNA levels at the C-terminus of all five of the fusion-positive cell lines tested (three ALK, one RET, and one ROS1) were elevated at least 2000-, 300-, or 2000-fold, respectively, and high C-terminal protein expression was detected. In an ALK fusion–positive tissue specimen, the mRNA and protein levels of C-terminal ALK were also markedly elevated. Meanwhile, in one of 36 RET fusion–negative cell lines, RET mRNA levels at the C-terminus were elevated at least 500-fold compared with the median of all 37 cell lines, and high C-terminal protein expression was detected despite the absence of RET fusion. This study of 37 cell lines and four tissue specimens shows the detection of C-terminal ALK or ROS1 proteins could be a comprehensive method to determine ALK or ROS1 fusion, whereas not only the detection of C-terminal RET protein but also other methods would be needed to determine RET fusion. The online version of this article ( https://doi.org/10.1186/s12885-019-5527-2) contains supplementary material, which is available to authorized users. Molecular subsets of non-small cell lung cancer (NSCLC) have been defined by various types of driver gene mutations involving epidermal growth factor receptor (EGFR), v-Ki-ras2 Kirsten rat sarcoma viral oncogene homolog (KRAS), and anaplastic lymphoma kinase (ALK) gene fusion. Specific tyrosine kinase inhibitors (TKIs), such as EGFR-TKIs (erlotinib and afatinib) and ALK-TKIs (crizotinib and alectinib), that inhibit the oncogenic activity of these genes have been developed and approved [1, 2]. A key issue in identifying patients that would be suitable for the targeted agents is precisely identifying the presence or absence of the driver gene mutations in a molecular diagnosis of the lung cancer. In approximately 5% of NSCLC, the rearrangement of the amino-terminal (N-terminal) region of echinoderm microtubule associated protein like 4 (EML4) with the carboxy-terminal (C-terminal) region of ALK occurs by inversion within the short arm of chromosome 2 . In cancer cells with EML4-ALK, the transcription of the C-terminal region of ALK depends on the promoter activity of the fusion partner, EML4, which is a housekeeping gene for the stabilization of microtubules during mitosis, by which the C-terminal ALK protein level also becomes elevated [4, 5]. To detect ALK fusion, there are three different techniques: fluorescence in situ hybridization (FISH), immunohistochemistry (IHC) and reverse transcription–PCR (RT-PCR) are available for the detection of ALK fusion . Although each test has some advantages and disadvantages, IHC is more useful as a routine screening method in clinical settings because of cost effectiveness and technical ease . The ALK IHC method determines whether tumor cells are harboring an ALK fusion using an antibody directed to the C-terminal ALK protein, but unlike FISH tests, it has been reported to show not only positive results in patients with ALK fusion–positive cancer but also false-negative errors in some patients who actually have ALK fusion–positive cancer [3, 6, 7, 8]. In addition to ALK fusion, RET proto-oncogene (RET) or v-ros UR2 sarcoma virus oncogene homolog 1 (ROS1) are rearranged in approximately 1% of NSCLC. In consequence, RET-TKIs (such as alectinib or vandetanib) and ROS1-TKIs (such as crizotinib or lorlatinib) are under development for fusion-positive NSCLC patients, and precise diagnostic methods for these fusions are needed [2, 9, 10, 11]. In this study, we verified the reliability of IHC methods that target ALK, RET, and ROS1 C-terminal protein as diagnostic tools for lung cancer by investigating whether the expression at the C-terminal region is elevated in each of the fusion-positive lung cancer cells compared with that in fusion-negative cells. The histology, driver gene mutation, culture medium, and supplier of the 37 human lung cancer cell lines are listed in Table 1 [12, 13, 14]. Cells were purchased from the American Type Culture Collection (ATCC; Manassas, VA), Korean Cell Line Bank (KCLB; Seoul, South Korea), Riken Bioresource Center (Ibaraki, Japan), Health Science Research Resources Bank (HSRRB; Osaka, Japan), National Cancer Institute (NCI; Bethesda, MD), Immuno-Biological Laboratories (IBL; Gunma, Japan), and Leibniz Institute DSMZ-German Collection (DSMZ; Braunschweig, Germany) and were maintained using RPMI1640 (Sigma-Aldrich (SIGMA); St. Louis, MO), minimum essential medium (MEM; SIGMA), McCoy’s 5A (Thermo Fisher Scientific; Waltham, MA), or Ham’s nutrient mixture F12 (HAMF12; SIGMA) supplemented with fetal bovine serum (FBS; Japan Bio Serum, Hiroshima, Japan) at 37 °C in 5% CO2. Authentication of all cell lines was conducted by DNA fingerprinting with short tandem repeat profiling using the Powerplex 16 HS system (Promega; Madison, WI). AD Adenocarcinoma, NS Non-small cell carcinoma, SQ Squamous carcinoma, AC Anaplastic carcinoma, LC Large cell carcinoma, AS Adenosquamous carcinoma, MC Mucoepidermoid carcinoma, DL Deletion, ND Not detected. Mutations were referred from 1 COSMIC cell database, 2 Yoshimura Y. et al., 3 Additional file 5: Figure S1a,4 ATCC’s datasheet, 5 Shimamura T. et al., 6 Matsubara D. et al. Four frozen lung cancer tissue specimens with paired non-tumor normal adjacent tissue (NAT) were commercially obtained from BioreclamationIVT (Hicksville, NY), and kept at − 80 °C until analysis. The specimens and their clinical and pathological features are listed in Table 2. All studies were ethically reviewed and approved by the ethical review committee at Chugai Pharmaceutical Co., Ltd. The committee is independent from the commercial aspect of the company by involving third-party members. RNA was obtained from the cells using a SV total RNA isolation system (Promega), and the cDNA was synthesized using a PrimeScript RT reagent kit (Takara Bio; Shiga, Japan). RT-PCR was performed using the LightCycler 480 system (Roche Diagnostics; Basel, Switzerland) and Taqman probes (Thermo Fisher Scientific) (Additional file 1: Tables S1 and Additional file 2: Table S2). The value of target mRNA expression normalized by GAPDH mRNA was calculated from the crossing point PCR-cycle of each mRNA using the LightCycler 480 software. Western blotting was performed by the capillary electrophoresis–based protein analysis system, Sally Sue (ProteinSimple; Santa Clara, CA), as described previously . The same amount of protein lysate was loaded in each analysis. The antibodies were shown in Additional file 3: Table S3, and we determined which terminus of protein is recognized by the antibody with reference to the supplier’s datasheet and NCBI reference sequence database (RefSeq) (Additional file 3: Table S3 and Additional file 4: Table S4). To examine ALK expression at the C-terminus in lung cancer cells with or without ALK fusion, we used 37 lung cancer cell lines (Table 1) that harbor already-known driver mutations, including ALK fusion and wild-type, to mimic the populations of patients with lung cancer as shown in Korpanty G.J. et al. . Both the NCI-H2228 and SNU-2292 cell lines had EML4-ALK variant 3a, and the SNU-2535 cell line had EML4-ALK variant 1 (Additional file 5: Figure S1a and Additional file 6: Figure S2). All ALK-TKIs (alectinib, crizotinib, and ceritinib) inhibited the cell growth of all ALK fusion–positive cell lines (IC50: < 500 nM) (Additional file 7: Table S5). However, the EGFR-TKI, erlotinib, did not inhibit the cell growth of ALK fusion–positive cell lines (IC50: > 1000 nM) (Additional file 7: Table S5), indicating that growth of these ALK fusion–positive cell lines strongly depends on the signal from ALK kinase. Moreover, in all ALK fusion–positive cell lines, mRNA levels of ALK at the C-terminal region, which is backward from the breakpoint at exon 20 in ALK rearrangement , were elevated by at least 2000-fold more than the median of all 37 cell lines, and high protein expression at the C-terminus was detected (Figs. 1a and 2). None of the ALK fusion–negative cell lines expressed any mRNA or C-terminal ALK protein. Meanwhile, the protein expression of N-terminal EML4 was detected in each of the 37 cell lines, independent of ALK fusion status (Fig. 2 and Additional file 8: Figure S4a). Next, we tested four lung cancer tissue specimens harboring ALK fusion, EGFR mutation, KRAS mutation, or none (Table 2). ILS31007 had EML4-ALK variant 3a, and markedly expressed mRNA, protein, and phosphorylation of C-terminal ALK compared with the other three ALK fusion–negative tissue specimens (Fig. 3a, b and Additional file 9: Figures S5a, b, c and Additional file 10: Figure S6). Expression of C-terminal ALK protein was not detected in the other three ALK fusion–negative tissues (Fig. 3b). Meanwhile, the N-terminal EML4 protein was expressed in all tumor tissues independent of ALK fusion status (Fig. 3b and Additional file 8: Figure S4b). Then, we used the non-tumor NAT specimens to investigate whether transcription of EML4 is constitutively activated even in normal lung cells. Firstly, in ALK fusion–positive ILS31007, we confirmed that the NAT specimens did not include any tumor cells (Additional file 11: Figure S7) and that the EML4 mRNA levels at exon1/2, 2/3, 5/6, or 6/7 in NAT were almost the same as those in the tumor tissues (Fig. 3c and Additional file 12: Figure S8). In the other ALK fusion–negative NAT specimens, more EML4 mRNA was expressed at each exon than in the tumor tissues. These data suggest that EML4 is constitutively transcribed by its own strong promoter activity in not only ALK fusion–positive and –negative lung cancer cells but also in non-tumor lung cells. RET is fused with genes such as KIF5B or CCDC6 in approximately 1% of lung cancers . We therefore examined RET expression at the C-terminus in 37 lung cancer cell lines with or without RET fusion (Table 1). The LC-2/ad cell line contained CCDC6-RET fusion (Additional file 5: Figure S1b and Additional file 6: Figure S2). One of the ALK-TKIs, alectinib, which has the potential to inhibit RET kinase activity , suppressed the cell growth of the LC-2/ad cell (Additional file 7: Table S5). In the LC-2/ad cell, the mRNA level of the C-terminal RET region, which is backward from the breakpoint at exon 12 in RET rearrangement , was elevated by at least 300-fold more than the median of all 37 cell lines, and protein expression at the C-terminus was also high (Figs. 1b and 2). Interestingly, despite being a RET fusion–negative cell line, the Calu-6 cell markedly expressed RET mRNA from the N- to the C-terminal region and C-terminal RET protein, and the cell was insensitive to alectinib (Figs. 1b and 2, Additional file 7: Table S5 and Additional file 13: Figure S9b). None of the 35 cell lines other than LC-2/ad and Calu-6 expressed any mRNA or C-terminal RET protein. Regardless of RET status, the protein expression of CCDC6 and KIF5B was detected in all 37 cell lines (Figs. 1b, 2 and Additional file 8: Figure S4c). ROS1 is rearranged with genes such as SCL34A2 or CD73 in approximately 1% of lung cancers . 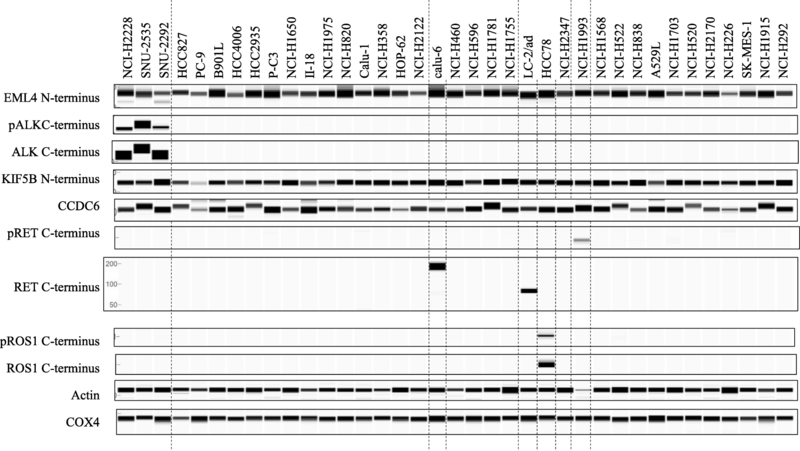 We therefore examined ROS1 expression at the C-terminus in 37 lung cancer cell lines with or without ROS1 fusion (Table 1). The HCC78 cell line contained SLC34A2-ROS1 fusion (Additional file 5: Figure S1c and Additional file 6: Figure S2). The ROS1-TKIs, crizotinib and ceritinib, suppressed cell growth (Additional file 7: Table S5). In HCC78 cells, the mRNA level of the C-terminal ROS1 region, which is backward from the breakpoint at exon 32 or 34 in ROS1 rearrangement , was elevated by at least 2000-fold more than the median of all 37 cell lines, and high protein expression at the C-terminus was detected (Figs. 1c and 2). Chromosomal rearrangements involving ALK, RET, and ROS1 are attractive anticancer targets that provide opportunities for therapies for patients with NSCLC . As described in previous preclinical studies [18, 19], only the three ALK fusion–positive cell lines in the 12 cell lines tested were sensitive to all ALK-TKIs (alectinib, crizotinib and ceritinib) through the suppression of phosphorylation of ALK signaling pathways involving STAT3/AKT/ERK (Additional file 7: Table S5, Additional file 14: Figure S3, Additional file 13: Figure S9, Additional file 15: Figure S10, and Additional file 16: Figure S11), indicating that the growth of these ALK fusion–positive cell lines strongly depends on the signal from ALK. In the US, both a FISH test using the Vysis ALK break apart FISH probe kit (Abbott Laboratories) and an IHC test using the Ventana ALK (D5F3) CDx assay (Ventana Medical Systems; Tucson, AZ) have been approved as a companion diagnostic (CDx) test for crizotinib . In Japan, the Vysis FISH test has been approved as a CDx test for crizotinib, and a diagnostic tool combining the Vysis FISH test with an IHC test using the N-Histofine ALK Detection kit (Nichirei Biosciences) has been approved as a CDx test for alectinib . These two IHC kits, which respectively include clone D5F3 or 5A4 as a primary antibody directed to C-terminal ALK protein, were highly concordant with the ALK FISH tests. However, it was reported that IHC-positive and FISH-negative patients were occasionally present, with these discordant patients showing a clinical response to crizotinib [6, 21, 22]. To identify patients who would be suitable for ALK-TKIs, the accurate diagnosis of ALK fusion is a critical issue. In this study, we focused on the reliability of the detection of C-terminus ALK protein for the diagnosis of ALK fusion using various types of lung cancer cell lines and tissues. We found that the promoter of EML4 was constitutively activated in lung cancer as well as normal cells independent of ALK fusion, and C-terminal ALK protein level and phosphorylation were specifically elevated in ALK fusion–positive cancer cells (Figs. 2 and 3b). As previously demonstrated [4, 7], these findings suggest that wild-type ALK is silenced in normal lung cells because of lack of production, but when C-terminal ALK is fused to N-terminal EML4 in normal cells, the transcription of the kinase domain of ALK is activated by the constant promoter activity of EML4, and the resultant abundantly produced EML4-fused ALK leads to cancer through aberrant ALK signal transduction. Therefore, IHC tests for ALK, such as those using the Ventana and N-Histofine kits, could be sufficiently reliable diagnostic methods in the treatment of patients with lung cancer using ALK-TKIs. As previously described in preclinical studies [16, 23, 24], 2 cell lines tested only LC-2/ad or HCC78 cell line with RET or ROS1 fusion were sensitive to RET-TKI (alectinib) or ROS1-TKIs (crizotinib and ceritinib) by suppressing the level of phosphorylation of STAT3/AKT/ERK, which are located downstream of RET or ROS1 kinase, respectively (Additional file 7: Table S5, Additional file 13: Figure S9a, Additional file 15: Figure S10 and Additional file 16: Figure S11). No IHC or FISH CDx tests that detect RET or ROS1 fusions have been approved, but an IHC test using an antibody clone, EPR2871 (Abcam), is under investigation . Although RET expression was low in normal lung tissue , discordant results between the IHC test and the FISH test for RET have been reported [26, 27]. 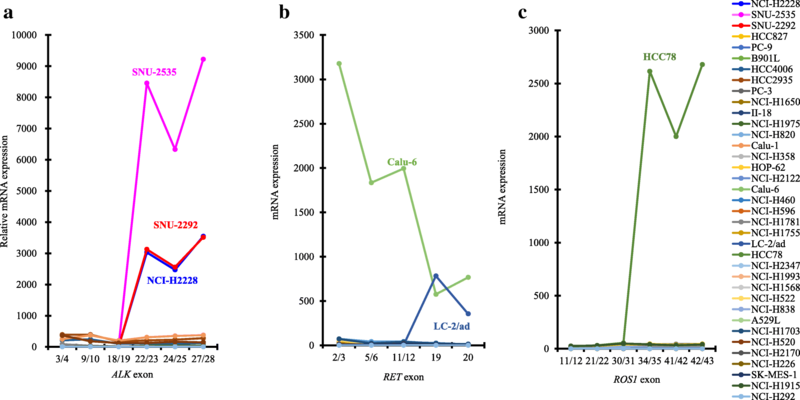 In this study, the promoter activity of KIF5B or CCDC6, which are two major genes involved in fusion with C-terminal RET, was constitutively activated in every cell line, and the expression of C-terminal RET was considerably high not only in the RET fusion–positive cell line LC-2/ad, but also in one of the five RET fusion–negative and KRAS-mutated cell lines Calu-6. Wild-type RET expression in Calu-6 cells has been also reported by Zhou et al. . The weight of RET protein in LC-2/ad or Calu-6 cells was, respectively, 50 to 100 kDa or 100 to 200 kDa (Figs. 1b and 2), which is approximately the same weight as that reported previously for, respectively, CCDC6-fused RET or wild-type RET [29, 30]. Just as surprisingly, in 37 cell lines, phosphorylation of the C-terminal RET domain was only detected in the RET fusion–negative and MET-amplified NCI-H1993 cell line (Fig. 2), but that elevation of the level of MET phosphorylation by trans-phosphorylation of MET within RET and MET heterodimers was reported in NCI-H1993 cells . Both Calu-6 and NCI-H1993 cells were completely insensitive to alectinib (Additional file 7: Table S5 and Additional file 13: Figure S9b and c), which means that cell growth with wild-type RET is independent of RET kinase even if the cells have high expression or high phosphorylation of RET, and RET kinase would be an oncogenic growth driver after fusion with, for example, CCDC6 or KIF5B. Taking all these findings together, the stand-alone RET IHC test for the detection of C-terminal RET protein may cause misleading judgments of RET fusion, and CDx tests with both IHC and FISH or RT-PCR would be needed in the treatment of patients with RET fusion–positive lung cancer using RET-TKIs. Regarding the ROS1 IHC test using an antibody for the C-terminus, some patients were reported to show discordant results between IHC and FISH tests despite low expression of ROS1 protein in normal lung tissue [11, 32]. However, in this study, the ROS1 fusion–positive cell line, HCC78, harboring an SLC34A2-ROS1 fusion only showed protein expression at the C-terminal domain and a sensitivity to the ROS1-TKIs by inhibiting ROS1 signaling pathways involving STAT3/AKT/ERK (Figs. 1c and 2 and Additional file 7: Table S5 and Additional file 15: Figure S10). SLC34A2 and CD74 are two genes fused to C-terminal ROS1, and SLC34A2 mRNA expression was shown in tissues and cell lines of NSCLC as well as normal lung tissues [33, 34, 35]. CD74 protein was also strongly expressed in many lung cancer tissues . Therefore, the C-terminal ROS1 protein level could only be elevated by the strong promoter activity of genes such as SLC34A2 or CD74 in ROS1 fusion–positive lung cancer cells, which suggests that the ROS1 IHC test is a reliable diagnostic test for the detection of patients with lung cancer who have ROS1 fusion. On the other hand, ALK or ROS1 IHC tests occasionally showed positive results even in patient samples diagnosed by FISH or RT-PCR tests to be fusion-negative [6, 8, 11]. As one of the causes of this IHC+/FISH- discordance, it was reported that wild-type FISH signals in fusion–positive cases were caused by rare atypical chromosomal rearrangements with EML4 and ALK . In addition, Takeuchi K et al. showed that ALK expression is detected in some ALK fusion–negative cases with small-cell carcinoma, large-cell neuroendocrine carcinoma, and poorly differentiated carcinoma . Hyper-methylation of promoter and copy number gain of ROS1 were reported as one of the mechanisms that activate ROS1 expression in fusion-negative carcinomas . However, the possible factors of discordances mentioned above have not been fully clarified at present. This study with 37 lung cancer cell lines and four tissues did not reproduce the phenomenon of discordance. Therefore, further studies using a larger panel with various types of lung cancer cell lines and tissues would be useful to elucidate the causes of discordance in clinical ALK or ROS1 IHC tests. Next-generation sequencing (NGS) technology enables high-throughput and multiplex analysis of various driver oncogenes. For NSCLC, NGS-based tumor-profiling multiplex gene panels, such as Oncomine Dx target test or FoundationOne CDx, have recently been approved as companion diagnostics to detect mutations of EGFR and BRAF, or fusions of ALK and ROS1 in the US . These NGS panels are also designed to detect RET fusions [39, 40]. At present, clinical diagnosis to select patients with ALK fusion–positive NSCLC is predominantly performed by IHC test, while NGS screening might have the potential to test for multiple gene alterations in a quick single analysis. In this study, we could not compare the analysis of fusions by IHC with that by NGS since we have no data on NGS. However, evaluations of the usability of diagnosis by NGS compared to IHC or FISH in NSCLC specimens showed that NGS screenings could provide an alternative method of detecting fusion genes to IHC or FISH tests [39, 40, 41]. Therefore, further studies of NGS in addition to C-terminal protein expression analysis using NSCLC cell lines would be a strong support to precise selection of NSCLC patients with fusion genes by NGS with or without IHC. We demonstrated that the transcription levels of ALK- or RET-fusion partner genes, such as EML4, CCDC6 and KIF5B, were constitutively activated in lung cancer cells, and the expression at the C-terminal region of ALK, RET, or ROS1 was also markedly elevated in each fusion-positive lung cancer cell. Moreover, although the expression of ALK and ROS1 at the C-terminus was very limited in all fusion-negative cancer cells, the expression or phosphorylation of C-terminal RET was markedly elevated in 2 of the 36 RET fusion–negative cancer cells. 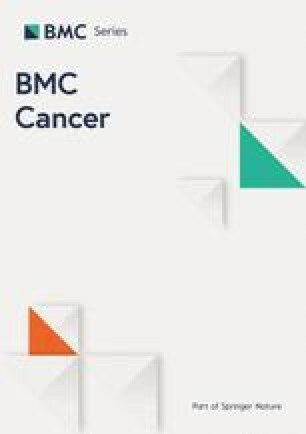 Our findings suggest that the measurement of C-terminal ALK or ROS1 protein could be a reliable diagnostic method for each fusion, whereas measuring C-terminal RET protein might be a diagnostic method with a potential to give false-positive results when detecting RET fusion in patients with lung cancer. The authors thank KY and MK for their technical support in the experiments. The study was funded by Chugai Pharmaceutical Co., Ltd., and no other specific funding was received for this study. KF performed all experiments, analyzed, interpreted the data, and was a major contributor in writing the manuscript. MM, MK and SS supported the experiments and analyses. NH and YY supported the interpretation and writing manuscript. All authors read and approved the final manuscript. Not applicable because all materials were commercially available products. All studies were ethically reviewed and approved by the ethical review committee at Chugai Pharmaceutical Co., Ltd.. The authors are employees of Chugai Pharmaceutical Co., Ltd., and declare no conflict of interest.